After a bucketful of build up, the day has finally arrived when THE HOTTEST SHOW ON EARTH will happen in Fort McMurray. Just a few short months ago the idea of hosting KISS, one of the biggest rock bands in the world, was a pipe dream, a wistful longing, an unreachable Rosebud. Now, Gene Simmons is comfortably resting somewhere within shouting distance from my open study window. 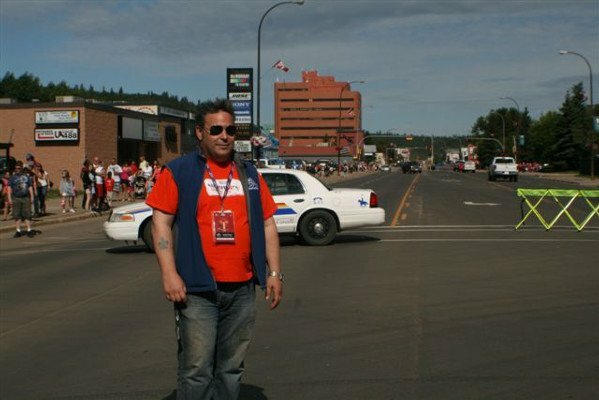 I spent 15 years organizing the interPLAY Festival in Fort McMurray, an exercise in planning and complexity that pales in comparison to what the Events Wood Buffalo and MacDonald Island Park gang have done to prepare for this day. 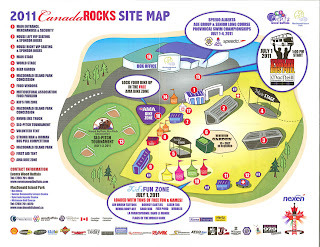 The concert site, put to the test with several lead-up events surrounding Canada Day, is incredibly laid out, sprawling, well-conceived and robust enough to comfortably handle the 11,000+ guests who will pour in when the gates open at 7 pm. 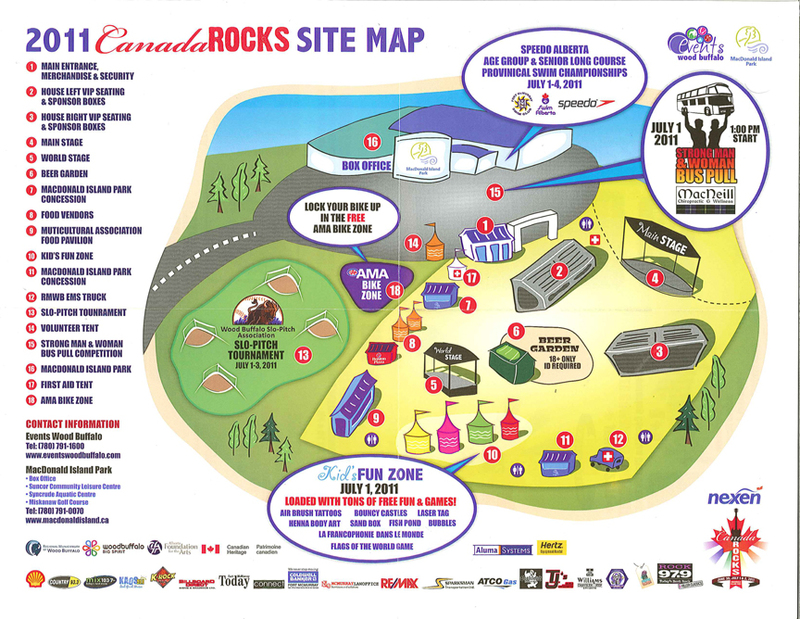 Much like the maze you go through to clear customs at the major airports, a similar crowd management strategy has been employed at the entrance of the CanadaROCKS site using construction fencing. Those that come early will be positioned near the front of this line - at least those with general admission tickets - ready to grab those coveted spots close to the stage with hopes of catching an errant guitar pick or a few orphaned drops of fake blood that will inevitably fly out of Mr. Simmon's mouth at one point or another. 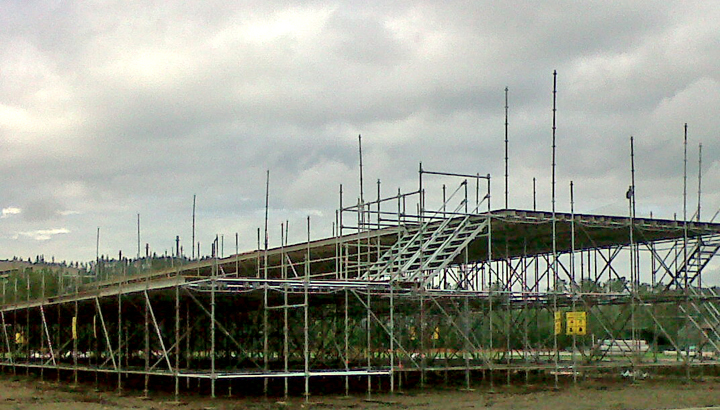 Sponsors and VIP ticket holders will be perched above the crowd, on scaffold structures built by Aluma Systems. 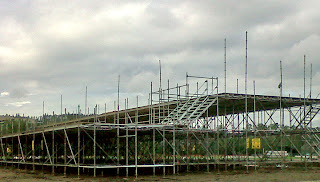 These two auspicious looking towers will hold about 500 people a piece and provide a superior view of the stage and ultimately, an amazing concert experience. The less overt elements of the concert site are the things that grab my attention: three impressive banks of porta-potties complete with hand-wash stations, more than several automated tellers to provide the streams of cash that will flow tonight, a plethora of tents to accommodate everything from catering to merchandise sales, an authoritative command centre perfectly positioned near the entrance to the site to set the right tone. This scale of event doesn't just magically happen. It takes incredible skill and effort to bring it all together in a short window of time. 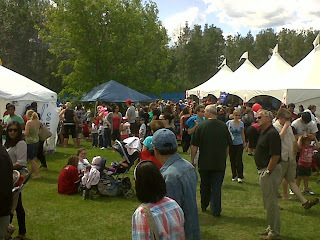 I am in awe of the collaborative effort that has taken place between the staffs of Events Wood Buffalo and MacDonald Island Park. Individually, they have an array of talent and knowledge, collectively, they have the capacity to deliver a world-class event in a way that this longtime event organizer does not take for granted. Claude Giroux, Executive Director of Events Wood Buffalo, and Tim Reid, Chief Operating Officer of MacDonald Island Park are the generals behind the scenes who have orchestrated the symphony that got us here. They did so by tapping into the support and knowledge of their respective boards, the expertise and dedication of their respective staffs, the passion and contributions of hundreds of community volunteers, the support and investment from a family of sponsors that would make most communities desirous, and the commitment and vision of a diverse community committee that has been meeting weekly in preparation for this day. Festivity is important. It allows us to come together as a culturally diverse community and share a common experience. Standing in the line yesterday in the middle of the family activities located just outside the main concert site, I was not only struck by the vast number of young families who had flooded to the event, but I was overjoyed at seeing people from around the world, celebrating the birthday of our beautiful country that embraces all people, their traditions, beliefs, fashions and forms of artistic expression. 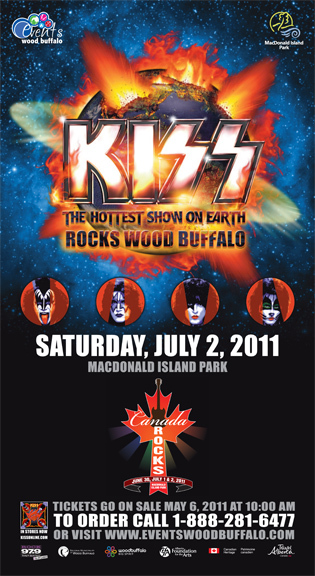 Tonight, Gene Simmons, Paul Stanley, Eric Singer and Tommy Thayer will emerge from their dressing room, walk up a short set of stairs and arrive in the spotlight of the mainstage at CanadaROCKS in Fort McMurray, Wood Buffalo, Alberta to begin THE HOTTEST SHOW ON EARTH - according to Gene, the most northerly performance of KISS since 1974 when they toured Alaska. It is impossible to accurately count the number of people who will have engaged with one of the many elements of the CanadaROCKS festivities stretched out over the past few days. But I would guess that the majority of our citizens still in town - many have left for the start of summer holidays - have had some connection with the celebrations. We are grateful to every one of the folks behind the scenes who have made the magic possible. I would hope that tonight, when 11,000 fans are on their feet cheering, that every member of the team - staff, volunteers, sponsors - embrace at least a portion of the cheers as their own. They are the HEART of Wood Buffalo.